When using standard nebulizers to treat asthmatic patients and others struggling to breathe, first responders and other healthcare professionals must take care to ensure that the medication chamber—and the patient— remain upright and steady so that the medication won’t spill out of the chamber. 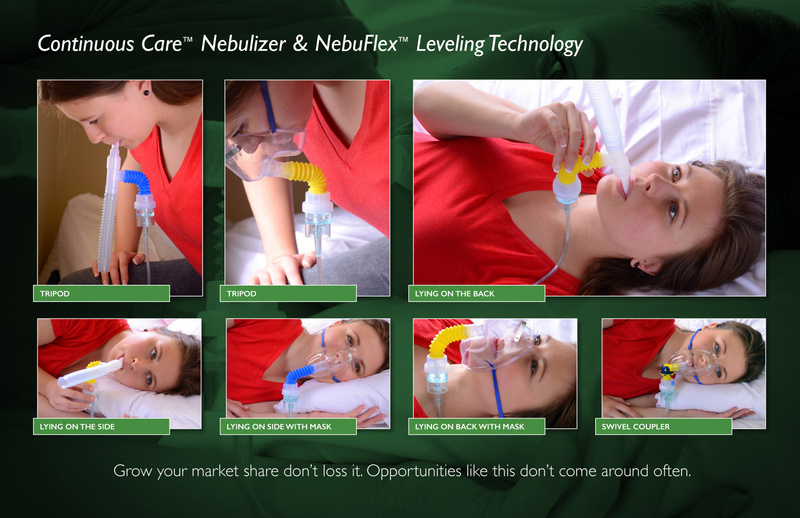 Enter the NebluFlex Continuous Care Nebulizer with leveling technology. Functioning much like a flexible straw, the NebuFlex allows the patient to receive life-saving medication safely, continuously and comfortably in any position. That means patients can now be in any position of comfort —whether it’s reclining, sitting in a tripod position, lying sideways, flat on their back, or even face down —and the NebuFlex will easily adjust to remain upright and level, providing uninterrupted respiratory medication delivery. The continuous care nebulizer portion, with its patented rapid medication port, won the top EMS Innovation Award at the National EMS show in 2009.